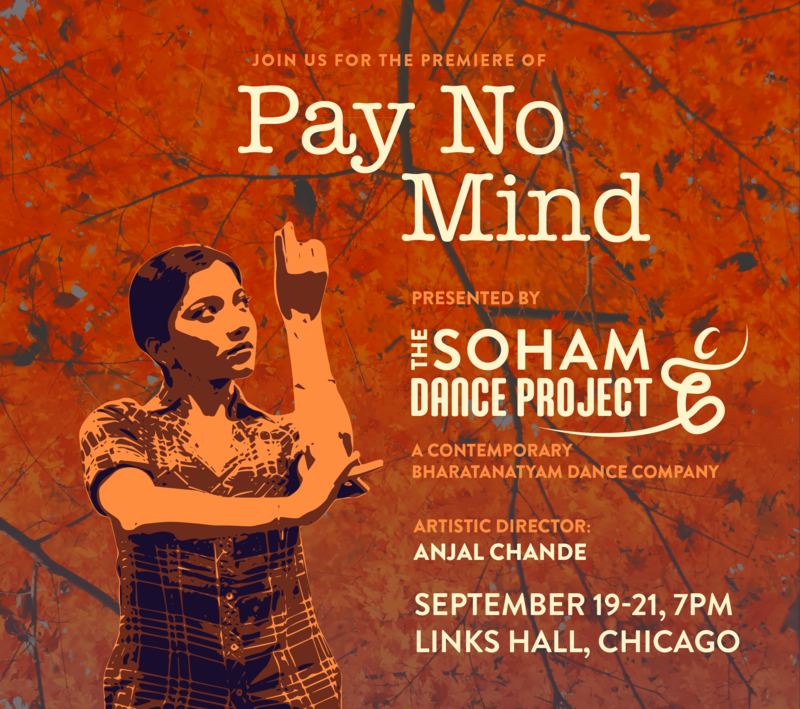 I spent my birthday this year with Soham Dance Space for a special Moving Dialogues during Chicago Dance Month (CDM). The theme of CDM 2014 was “Open doors, open spaces,” and the narrow studio‘s warm and welcoming feel was echoed by owner Anjal Chande’s calm and genuine presence. Chande is tiny in stature, but watching her dance, one might think her 5’9″. So it was this weekend at Links Hall for the premiere performance of the newest branch of the Soham school: a professional company of just three members dubbed Soham Dance Project (SDP). SDP follows the same school/company model as Visceral Dance Chicago, although the two projects are aesthetically, and philosophically miles apart. Chande built her school (and now her company) on the premise that bharatanatyam (traditional Indian dance) is an evolving artform with a capacity for contemporary themes and an intercultural dialogue. Chande’s inaugural work, Pay No Mind, places an acute lens on the modern-day Indian American, and how one finds his/her identity and truth amidst all the noises of life. Coincidentally, I had brought some reading for before show (good thing, considering the house was held for a solid 25 minutes). Anyway, this book chapter on identity formation by Margaret Beale Spencer* was, believe it or not, the perfect compliment to Pay No Mind. Specifically, the chapter discusses the difficulty of second-generation South Asian immigrants in cultivating their identities. Many immigrants have identities firmly planted in the traditions and culture of their home country, which explains why Chicago neighborhoods with high proportions of a certain immigrant group don’t look much different than the country from which the group immigated. Their children, however, often born in the US, are on a tightrope between two cultures. Looking around on Friday night at Links Hall, I saw evidence of this in the audience. The older adults were dressed in traditional Indian garb, while the younger patrons dressed in highly Americanized clothing. Pay No Mind is a short piece, but not lacking in impact. The stage is simply dressed, with understated, elegant lighting from Jacob Snodgrass, and the colorful costumes pop from all the white trappings of Studio A. Chande places herself and the two other performers (Savitha Chelladurai and Rasika Ranganathan) in various vignettes, exploring conformity and rebellion, interspersed with Chande dancing solo to her own voice in a recorded reading. Can I wear that? Tell me what to do. Tell me what to think. Tell me how to think differently, so I can seem an individual. The particularly challenging aspect of identity formation in second-generation South Asians (as I read before the lights dimmed) is navigating between a collectivist society and an individualistic one. Adopting an identity that is wholly American, despite being born and raised in the US, can seem selfish and disrespectful to the family, who likely gives priority to the group over the self. The dance echoes the recorded text, as the three women alternate between gestures of submission and gestures of strength. Traditional mudras are interspersed with modern day facial expressions and hand gestures, and the phrases of classical bharatanatyam are infused with stylings from contemporary dance. The feel of Pay No Mind is very much the same as the feeling I got on my birthday: warm, gracious, elegant, and strong. It seems that everything Chande touches is beautiful, and the complementary reading I happened to have in my handbag that night enriched my experience and augmented my ability to understand the work that she does every day. Chande is smart, fearless, and intoxicating to watch. Make no mistake, all three dancers were lovely, but perhaps because Chande has so much experience as a solo performer it’s almost impossible to take your eyes off her (sorry not sorry).